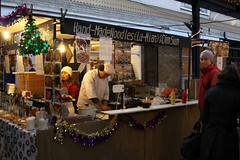 And, most importantly, the place is filled with good food stands. One in particular, however, stands out. At the sound of them market was a small stand selling, simply, “Hand-Made Noodles”. Run by a friendly Chinese guy, he was making hand-pulled La-Mian noodle dishes to order, so as you ordered, he’d cut off some dough and pull some fresh noodles, throw them in some cooking water, add some bok choi, and then build the rest of your dish around it once the noodles and bok choi were cooked. Carol was the first one drawn in. After making a giant batch of char sui pork for ourselves a few weeks ago, we had really been enjoying all sorts of char sui pork dishes and dumplings. 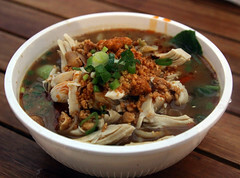 So Carol decided to order some La Mian hand-pulled noodles with Char Sui. 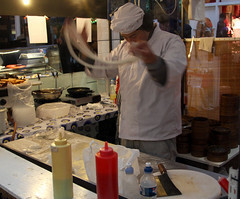 The man dutifully sectioned off some dough, and in an impressive display of noodle pulling, quickly made the noodles for Carol’s dish and put them in the water to cook. A bit of broth, a few chopped veggies, and some char sui, and there it was, a perfect little bowl of noodle soup with pork. 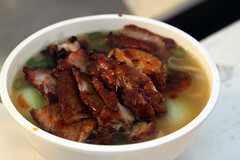 The pork was delicious and tender, the broth flavorful, and the noodles delightful. Myself, I opted for the Szechuan Dan-Dan and La-Mian: shredded chicken with peanuts and sesame, lots of hot oil, and several veggies cooked with the noodles. The procedure was the same, but the end result being a nice, firely Szechuan-style noodle dish, with just enough chili kick and sesame oil to really make this the perfect warm up dish for a cold, drizzly, and overcast day. Every once in a while it’s nice for me to do a followup on old favorites, revisiting them and make sure that they are staying in form. One of my oldest reviews on this site is almost 12 years old: a visit to the famous Regency Cafe, which is pretty much the canonical British “Greasy Spoon” for the London area, attracting a wide cross-section of London society all looking for the classic, stick-to-your-ribs old-fashioned Full English Breakfast, aka a “Fry up”. Actually, this is probably my dozenth visit to the Regency “Caff” since first coming in 2006, I usually make it a point to visit at least once every trip (although holiday closings and my odd travel schedules have prevented that a few times). So, while they neighborhood has changed a bit (like much of London, sprouting newer, taller buildings), the Regency is still going strong.